Hardcover, 11 x 10.25 in. / 320 pgs / 370 color. "The Unseen Eye by W.M. Hunt is perhaps the most compelling anthology of photographs I have encountered. 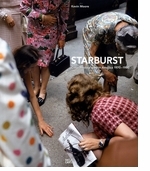 Comprised of 370 images from Hunt's largest collection of photographs, Collection Dancing Bear, it is a unique assortment of images, ranging from vernacular photographs from the 19th and 20th centuries, to iconic reportage images, to photographs from the giants of the photographic art world." Edited and with text by W.M. Hunt. Introduction by William A. Ewing. The Unseen Eye presents a wonderfully idiosyncratic and compelling collection of photographs assembled around a particular theme: in each image, the gaze of the subject is averted, the face obscured or the eyes firmly closed. The pictures present a catalog of anti-portraiture, characterized at first glance by what its subjects conceal, not by what the camera reveals. Amassed over the course of 30 years by New York collector W.M. Hunt, the collection includes works by masters such as Richard Avedon, Diane Arbus, Imogen Cunningham, William Klein, Robert Mapplethorpe and Robert Frank, as well as works by lesser-known artists and vernacular images. Hunt's instinctive pursuit of striking images has resulted in a collection that manages to evoke a picture of humanity from birth to death, with all the associated nuances of memory, wit, eroticism, fear, grief and horror. More than 350 intensely evocative and frequently surreal images are brilliantly sequenced in this volume; the cumulative effect is unnerving and riveting. Most critically, the images are drawn together by the narrative of the collector himself, in a highly personal monologue that weaves throughout the book, in which Hunt offers his own perceptive responses to the images he has gathered over many years. The result is a series of surprising epiphanies about how and why one collects. 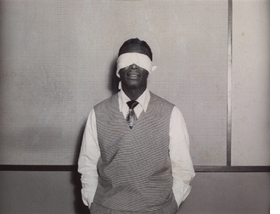 Featured image, "Nat King Cole (Blindfolded)," by Miller-Ertlas Studios (circa 1950), is reproduced from The Unseen Eye: Photographs from the Unconscious, Aperture's haunting and beautifully produced volume of photographs of people, or subjects, with their eyes averted, culled from the world-renowned collection of W.M. Hunt. Featuring works by masters such as Richard Avedon, Diane Arbus, Imogen Cunningham, William Klein, Robert Mapplethorpe and Robert Frank, as well as works by lesser-known artists and vernacular images, the Hunt collection has been amassed over the course of 30 years by one of New York's most astute and passionate judges of photography. 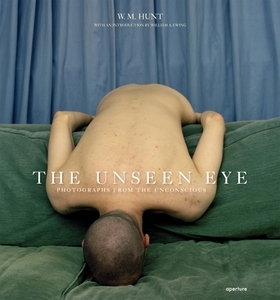 In his preface, Hunt writes, "This is a book of photographs, a selection from a large collection gathered over many years, comprised of what I describe as magical, heart-stopping images of people in which the eyes are somehow obscured, veiled, hidden, blocked, averted or closed. I have never really sorted out why I was initially drawn to collecting, to something so particular, or what fueled and sustained this passion. However, I maintain that these are all portraits of me. They are all, in their unique way, manifestations of my unconscious." The Unseen Eye by W.M. Hunt is perhaps the most compelling anthology of photographs I have encountered. Comprised of 370 images from Hunt's largest collection of photographs, Collection Dancing Bear, it is a unique assortment of images, ranging from vernacular photographs from the 19th and 20th centuries, to iconic reportage images, to photographs from the giants of the photographic art world. 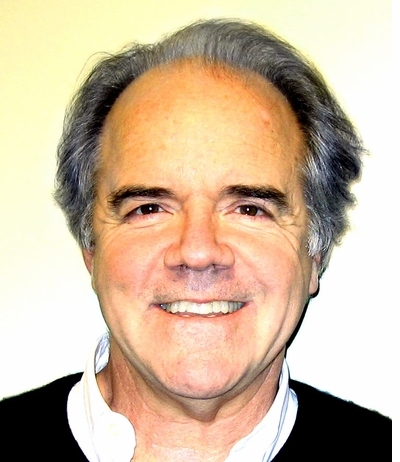 Hunt is a collector, and has been for more than 30 years. His is a curious collection: all of his photographs are about concealed or obscured eyes. As a result, his book, which draws only from his collection, is all about the role the viewer plays in photography and what it means to look at pictures. With works from photographers like Brassai, Joel Peter Witkin, Cindy Sherman, Alexandra Boulat, Adam Fuss, it is also an impressive survey of photography from the 19th century to the present. "Let's then take our guide's advice, and look at what he has harvested: at the sweetest (or most pungent) erotica, and the most disagreeable scenes of war. Let's look in every nook and cranny of photography, high-brow and low, at amateur awkwardness and professional panache. At photographs made casually with no thought whatsoever of compositional aesthetics, and at pictures realized with great care; at accidental photographs and those made with clear intent. Let's look at fashion, at the proud products of the classiest portrait studios, and at the harmless antics of the oh-so-common photo-booth (p. 155). At fact and fiction; at images caught on the fly, or meticulously fabricated in the studio; at collage and montage; at real faces and at wholly imagined ones. And let's embrace the whole long history of nineteenth- and twentieth-century photography, gathering in the faces of the known and the unknown, of the living and the dead, at faces in ethnography, sport, dance, theatre and the circus (not a bad word, in fact, for the larger human canvas). At the faces of skittish NASA wives at the critical moment of the astronauts’ blastoff, and at American school children screwing their eyes shut in a game that might be called 'Let's play Armageddon' (p. 97). Let's look far and wide at eyeless faces, with the eyes we have, at sights unseen." William A. Ewing, excerpted from the introduction to The Unseen Eye. FORMAT: Hbk, 11 x 10.25 in. / 320 pgs / 370 color.